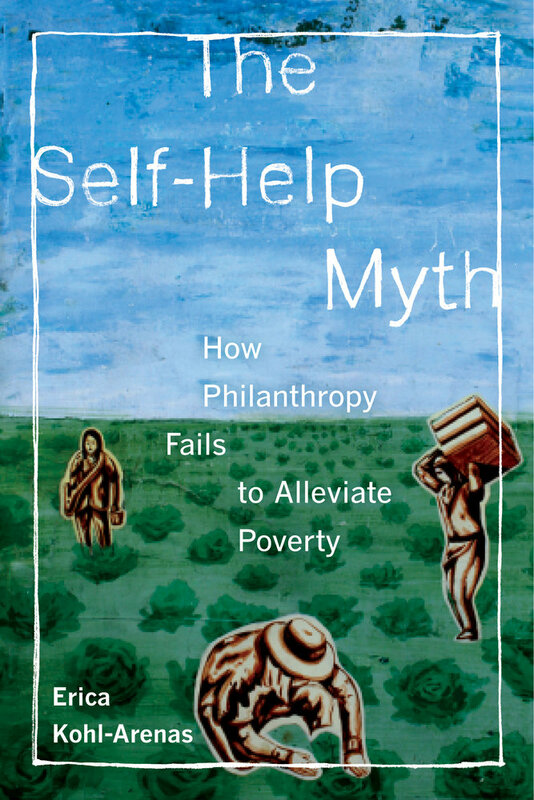 If there was such a thing as an award for best chapter in a monograph, I would definitely nominate the first chapter of Erica Kohl-Arenas’ book ‘The Self-Help Myth-How Philanthropy fails to alleviate poverty’. The chapter provides an excellent overview over core debates about philanthropy, beneficiary participation in self-help projects and how such approaches have a historical legacy of failing farmworkers in California. By separating questions of production, labor, institutionalized structural inequality from the moral and behavioral explanations of poverty, the self-help approach has been depoliticized-excluding action that challenges the status quo (pp.16-17). But the philanthropic self-help industry is not simply a contemporary manifestation of today’s capitalistic dynamcis. not through explicit agendas of control, but through negotiation, compromise, and increased professional administrative demands (p.40). The self-help formulation that was acceptable to funders, middle-class consumer boycott supporters, and eventually even a worn-down Chavez consumed with protecting his own power was that of the poor field hand in need of skills, education, and philanthropic charity-but not a movement in struggle for self-determination, community control, and economic power for the workers (p.75). As we are entering the ‘neoliberal era’ of the 1980s many powerful factors and institutions of a professionalized ‘third sector’ are already in place, making fundamental changes even more difficult. By the middle of the 1990s a professional culture and ‘habitus’ are firmly embedded in farmworkers quests for better working and living conditions. Farmworker and immigrant organizations have started with ‘collaborative initiatives’ that foster three main professional practices: a ‘foundation-promoted “civic participation” theory of change’ with a focus on ‘civic responsibilities of poor immigrants’, collaborative grant contracts that hold ‘advocacy organizations accountable to funders, not communities’ and foundation-driven ‘selection of partners’ without taking shared identities, leadership and membership into consideration (pp.79-81). As ‘social capital’ research and capacity-building workshops enter the scene, I was reminded of the critical debates in international development that emerged in the early 2000s around ‘NGOization’ and the institutionalization of civil society and social movements. found herself overwhelmed by festival organizing duties, a changed relationship with local groups vying for stipends to participate, and an organizational program increasingly distant from their mission to convene immigrant leaders in popular education and movement building across the region (p.112). For many high school teachers, college professors or medical practitioners these tendencies of bureaucracy taking over core aspects of a profession or mission will sound all too familiar. One of Kohl-Arena’s many skills is that her narrative does not provide simple answers to the reader, pointing out ‘the industry’, ‘lobbyists’ or an active conspiratorial regime as culprits. The third and final case study (chapter 4) introduces the ‘now hegemonic “win-win” or “double-bottom-line development” trend in poverty alleviation, which proposes that what is good for capital is good for the poor’ (p.124). The “win-win” paradigm brought new ways of speaking about poverty in agricultural communities, simultaneously silencing older notions of “antagonistic” organizing and producing new frameworks that lack radical socola imagination (p.127). In short, this is the time when young, college-educated women with farmworker parents are invited to lead foundation programs. Kohl-Arenas explores a theme that has been part of this blog’s broader framing-from the ‘Oprahfication’ of development discourses to focusing on charity ‘heroes’ and ever-expanding philanthrocapitalism. To keep the growers involved in the project, she describes a program that trains ‘workers in a culture of compromise, focusing on ways they can improve their own skills, productivity, lives and communities through leadership development programs’ (p.141). In an unimaginative environment where everyone is fearful of confronting growers (…) relationships between private foundations, professionalized advocacy organizations, and other regional stakeholders have solidified a limited understanding of what is possible in addressing enduring poverty and inequality (pp.167 & 170). My research uncovered how leaders and professional staff seeking private funding during the social movements of the 1960s, the civic-participation initiatives of the 1990s, and the entrepreneurial “double bottom line” development projects of today have had to promote programs that ask the poor to help themselves while evading the root causes of poverty and inequality (p.176). Even if this may hardly come as a surprise for those who have been engaged in international development and have seen many a discourse rise and turn into a depoliticized manual, such historically disempowering processes still deserve critical self-reflection on our own positionality and professional co-optations. Aligning farmworker rights, health, and safety with the increasingly popular food movements is a particularly hopeful strategy (p.187). So will hipsters and foodies ‘save’ agricultural production or is the system broken beyond repair? I would recommend The Self-help Myth without any hesitation for development studies or development anthropology courses. Not simply because of the timely content and the historical depth behind it, but because it is such an effective teaching, learning and communication tool. Well-researched, well-written and well-edited, Kohl-Arenas delivers her poignant observations and powerful analysis in an accessible and readable style. She needs less than 200 pages and avoids the pitfalls of many textbooks and academic writing in general. Given her long-term research, community engagement and own positionality her story could have easily ended up as a detail-heavy wordy jungle of words that only insiders would be able to penetrate. But when all is written and done, The Self-Help Myth rises to be a stellar example of modern, critical, ethnographically informed research communication that not only is a joy to read, but equally to discuss with students or recommend to fellow researchers. Add it to your reading list! 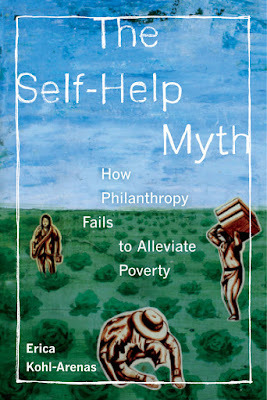 Kohl-Arenas, Erica: The Self-Help Myth: How Philanthropy Fails to Alleviate Poverty. ISBN 978-0-520-28344-2, 252 pages, USD 29.99, University of California Press, Oakland, CA, 2015. Thank you for the generous review! Much appreciated!